This document will explain how to configure GSuite and the Gluu Server for single sign-on (SSO). It is highly recommended to use Google's staging apps environment before migrating to production. You can do that here. Don't forget to add at least one more user account(we are going to use that user to test SSO) other than default 'admin' account you are using in Google Admin panel. If you already have an account skip to the next section. Login to your GSuite admin dashboard here. From the list of options choose the Security tab. A new page will open. 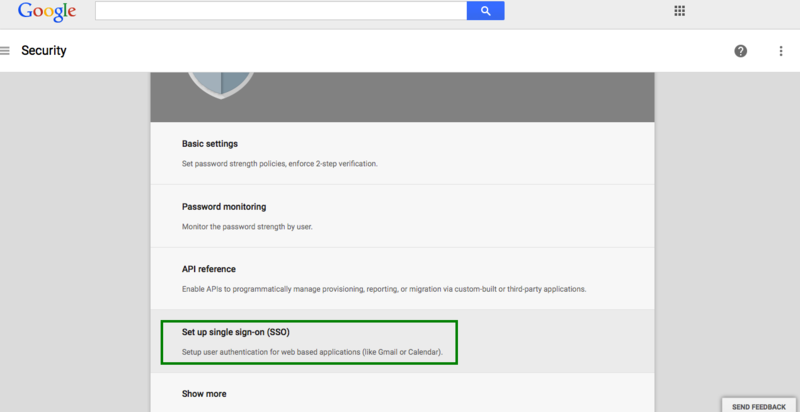 Select Set up single sign-on(SSO) from the options. Single Sign-On setting page will appear. This page contains a number of selection, and entry fields. Setup SSO with third party Identity Provider: This refers to your Gluu Server instance. Enable this box. Sign-in Page URL: Enter the uri of the sign-in page, for example https://idp_hostname/idp/profile/SAML2/Redirect/SSO. Sign-out Page URL: Enter the uri of the logout page, for example https://idp_hostname/idp/logout.jsp. Change Password URL: The uri an user is redirected if he wants to change his password. It is recommended that an organization provides such a link for its end users. Use a domain specific issuer: Enable this box to use a domain-specific issuer. Save your data using the Save changes button on the lower right of the page. Refer Google SSO to know more. Now we need to get the Google Metadata and create a SAML Trust Relationship in the Gluu Server. Trust Relationships are created so that the IDP (your Gluu Server) can authorize/authenticate the user to the service provider (SP)--in this case, GSuite. In order to create a Trust Relationship, we need to grab the metadata of GSuite. This metadata can be collected from Google. It's generally specific to an organization account. The following is a template of the Google metadata. Replace domain.com with your own domain name(the one used when creating Gsuite account). Got the metadata? Great, we are ready to move forward. We are going to use 'googlenmid' as custom nameID which is 'email' Type and 'mail' attribute value will be this nameID's source attribute. The unspecified mean the SP don't care about the nameID format. But in our case we know that Gsuite require an email(user@yourdomain) address. This is why we are going to configure shibboleth to support email. Edit the file /opt/gluu/jetty/identity/conf/shibboleth3/idp/relying-party.xml.vm and set the namedIDFormatPrecedence to urn:oasis:names:tc:SAML:2.0:nameid-format:email. 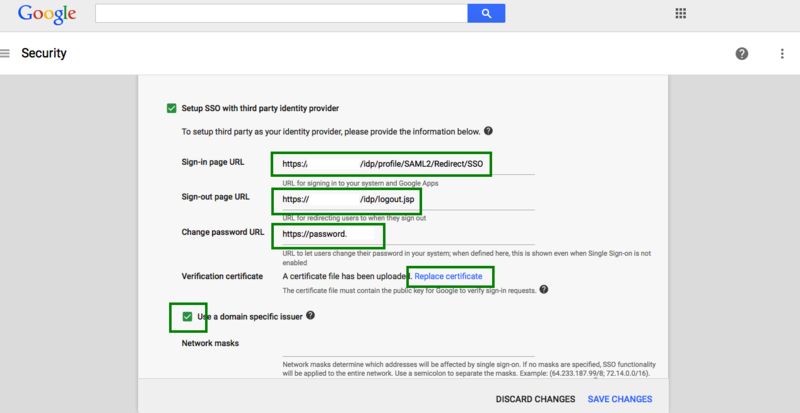 'Register' this 'googlenmid' in your Gluu Server by following this doc. How to create a trust relationship can be found here. We need to follow the "File" method for Google Apps trust relationship. Upload the metadata which we created couple of steps back. You need to release the following attribute: mail and googlenmid. Relying Party Configuration: SAML2SSO should be configured. Create an user in Gluu Server representing the Gsuite account you want to log into ( 2nd user other than G-Suite admin account ). Make sure the user created in step one has mail attribute available whose value is equals to what is given there in G-Suite account (example user@yourdomain).